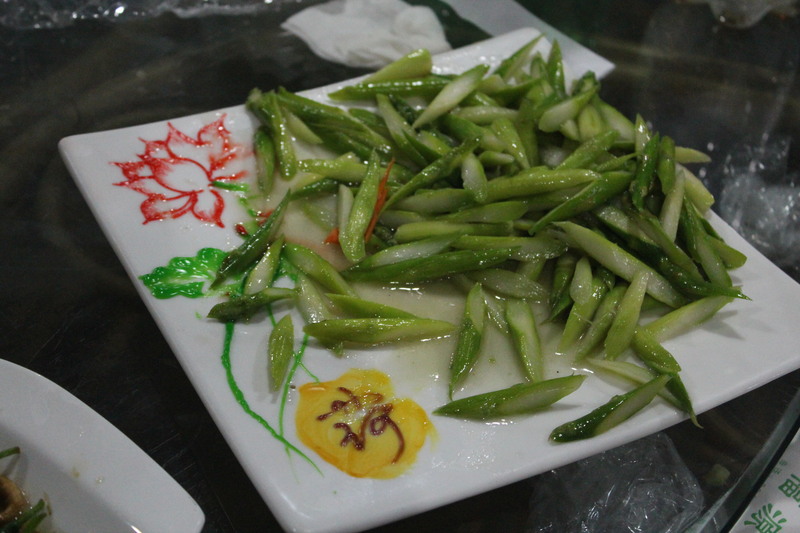 Eating in China is always a big adventure, but my favorite part is the presentation. Restaurants don’t just bring food to the table. Instead, they take a lot of care in how the food is arranged on the plate. While they may not put as much emphasis into the sanitation as we do in the U.S., presenting the food to customers is a real art. Below are some of my favorite examples to give you an idea of how thoughtful people can be about the way they display their food. I’m sure if restaurant owners in other countries follow these tips from China, they’ll make it big! Tip #1: Always include the head. 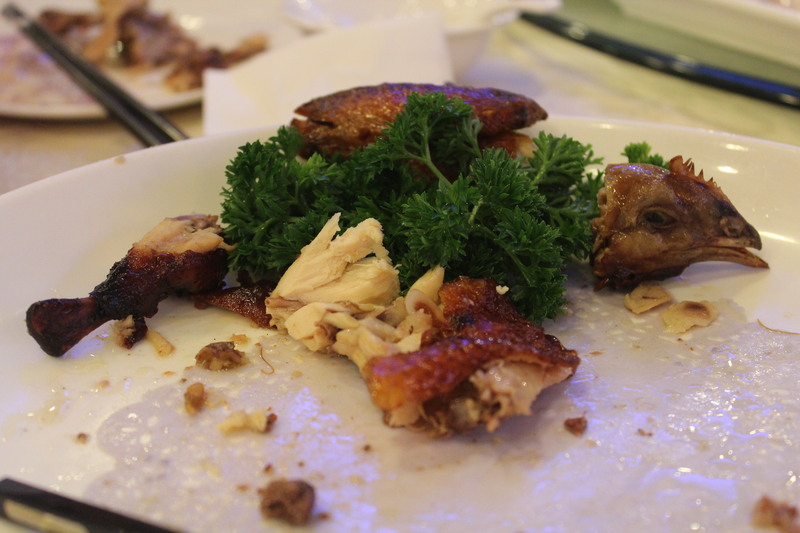 Some local Chinese people like to eat the brains of the chicken. For real. Tip #2: Display food in patterns, paying attention to color. 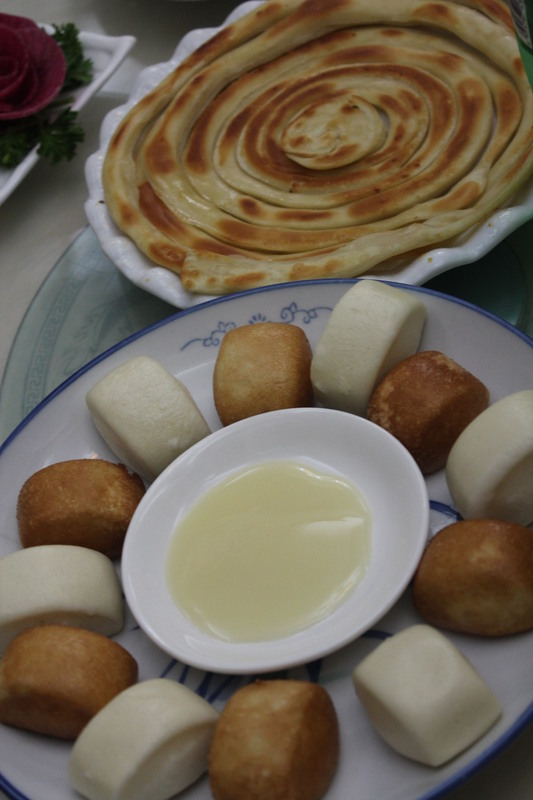 It looks much cooler if you alternate steamed buns and fried buns, even though they are equally delicious when dipped into sugary sweetened condensed milk. Tip #3: Add decorations when possible. 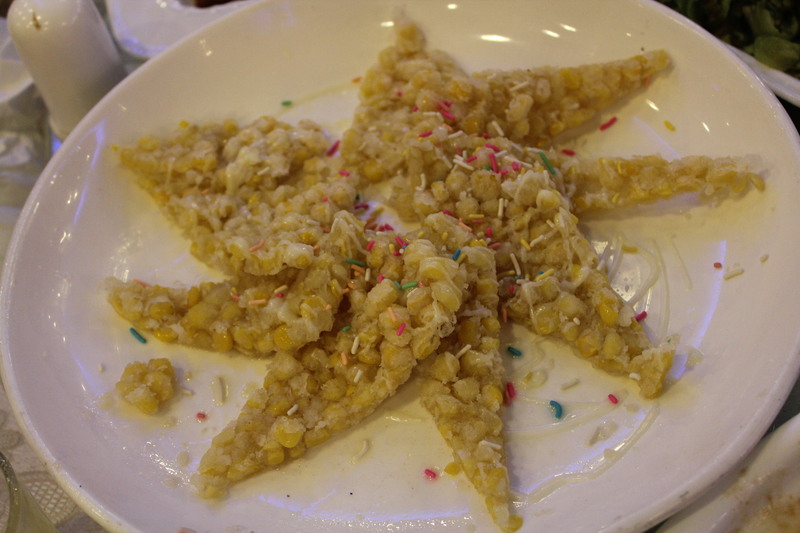 As you can see, icing on the plate, flowers, and shaping rice into a pyramid all look much more awesome. Tip #4: Write notes to your customers. As long as it’s in English, it’ll look fabulous. Tip #5: Hire an artist to prepare your plates. Icing art makes everything taste better. Note: For the record, the sweet corn fritters were yummy. And the restaurant didn’t place the chicken head like that. I arranged it on the plate that way for the photo, after we had already eaten most of the chicken. Also, we have no idea why it said “I love you” on our plate. But the mashed potatoes with blueberry sauce were interesting, despite being kind of weird. I’ve noticed the decorations (adding flowers, plants, etc.) on the plates when I was in China too. But I haven’t seen some of these before! Like the corn fritters, how do you think they were made? Was the food good? My stomach’s rumbling just looking at these!! The steamed and fried buns look great!! 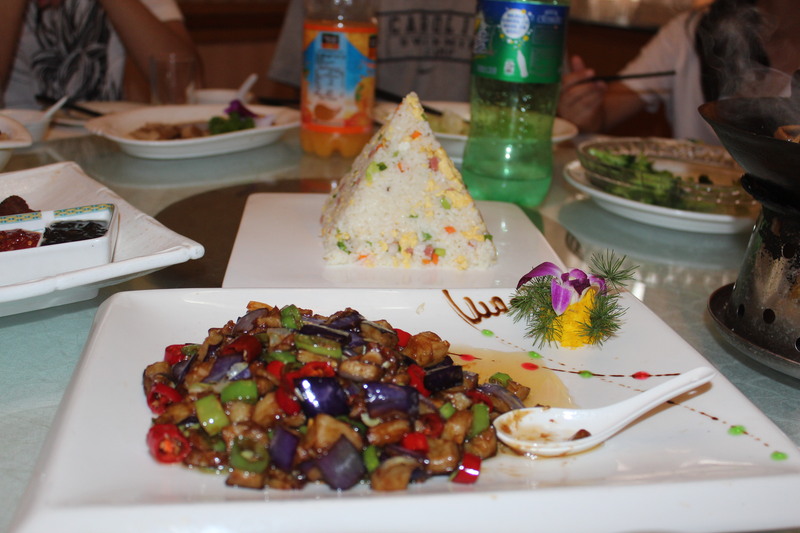 The pieces of eggplant and rice look delicious!! I think the rice pyramid was really creative!! The others look just as good (like the corn fritters!). Say, which picture had the mashed potatoes with the blueberry sauce in it? 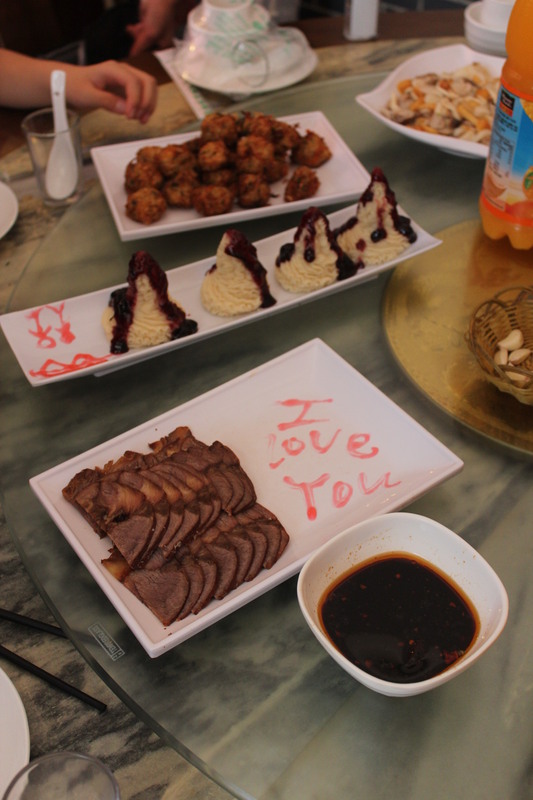 I’m not sure why they wrote “I love you” on the plate either. All those foods look good! I wish I could bring some back for you to try! They are good! I So want to try the foods in the 4th picture, It looks so delicious!!! !